These 5" swivel top machine rollers are perfect for moving heavy machinery loads of up to 15000 lbs. Axle friction is eliminated when load weight is transferred from plate to rollers. Vestil VHMS-15 Machine Rollers feature swiveling tops that rotate at 360 degrees for maximum maneuverability. 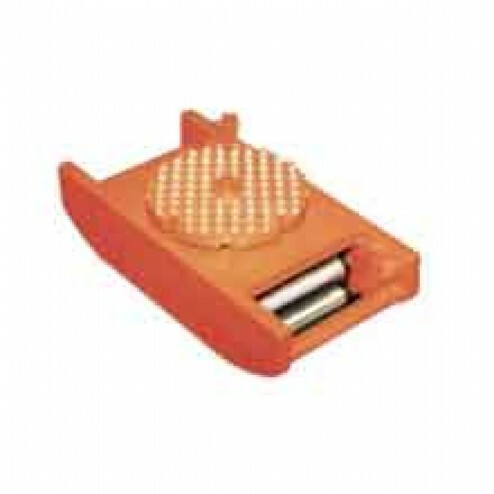 Roller Top: Swivel, 360 degree. Body Size: 3-3/4" x 10-1/2"
Form a "tank track" that will allow rollers to revolve around a center load bearing plate within the frame. Swivel tops include steel ball bearings that make turning easy. Axle friction is eliminated when load weight is transferred from the load bearing plate to the rollers. Swivel top features a spring loaded locking mechanism. Steering bars help move rollers along and can be split into two for easy storage.